King Street, London, October 4, 2007– Christie’s announce that they will offer at auction a remarkable discovery, The Rothschild Fabergé Egg. Previously unrecorded and an addition to no more than 12 documented examples known to have been made to Imperial standards for anyone other than the Russian Imperial Family, this exceptional work of craftsmanship is expected to realize £6 million to £9 million ($12 to $18 million) and potentially establish a new world record price for a Russian object. The Rothschild Fabergé Egg will be offered at the auction of Russian Works of Art on 28 November 2007, and will highlight Russian Art Week, a series of auctions dedicated to Russian Pictures, Works of Art, Books, Manuscripts and Icons which will take place in London from 26 to 29 November 2007. The Rothschild Fabergé Egg has never been published and has only ever been recorded in private family records. The egg was a gift from Beatrice Ephrussi (1864-1934) (neé de Rothschild) to Germaine Halphen (1884-1975) on the occasion of the latter’s engagement to Beatrice’s younger brother, Baron Edouard de Rothschild (1868-1949). They married in 1905 and it has remained in the family ever since. Beatrice’s husband Maurice Ephrussi (1849-1916) was born in Odessa, Russia, and worked for the Rothschild family’s oil interests in Baku*. He went on to become a banker, helping to establish the Ephrussi Bank in Paris. It is possible that Maurice ordered the egg whilst in St. Petersburg, or during one of Fabergé’s selling trips to Paris at the turn of the 20th century. The Rothschild Fabergé Egg is a superlative masterpiece by a master-craftsman. 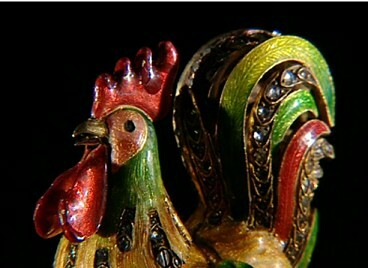 Exceptionally large with brilliantly chased vari-coloured gold work and enameled in Fabergé’s most exciting and lively colour – a lovely translucent pink – its face is a clock and it contains an automaton cockerel. Every hour, the diamond-set cockerel pops up from inside the egg, flaps his wings four times and then nods his head three times while opening and shutting his beak and crowing. Each performance lasts approximately 15 seconds, before the clock strikes the hour on a bell. 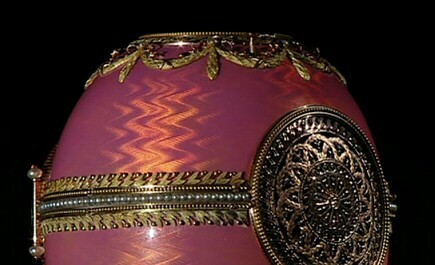 The egg is hallmarked under the enamel by Fabergé’s leading workmaster, Michael Perchin, and is further signed and dated, K. Fabergé, 1902. 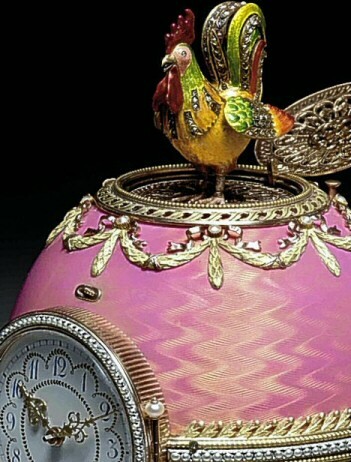 This is one of only three known examples with both a clock and an automaton, the others being the Imperial Cockerel Egg of 1900 and the Kelch Chanticleer Egg of 1904. There are no more than 12 recorded examples which are known to have been created to Imperial standards for private clients, to which the Rothschild Fabergé Egg is an exciting addition. The most renowned are those commissioned by the Duke and Duchess of Marlborough (The Duchess of Marlborough Egg), Emmanuel Nobel (Nobel Ice Egg), seven eggs made for the industrialist Alexander Kelkh and his wife, who took delivery of an egg every year from 1898 and 1904, and an example commissioned by Prince Felix Feliksovich Iusupov (The Youssoupov Egg), who was married to the Czar’s niece and assassinated Rasputin**. The Rothschild Egg is very similar to the Kelch Chanticleer Egg. To see both Eggs together, click here! 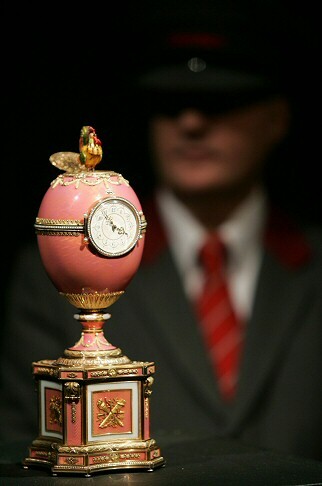 The Rothschild Fabergé Clock Egg was sold November 28, 2007 at Christie's in London to Russian art collector and businessman A. Ivanov. 2007 Sale of the Rothschild Fabergé Clock Egg click here! New Owner. On Monday December 8, 2014 the Fabergé Rothschild Clock Egg was a present to the State Hermitage Museum in Saint Petersburg, Russia, by the President of the Russian Federation. Together with another important Fabergé piece, the Alexander III 25th Anniversary Clock, the gift was made at the occasion of the 250th anniversary of the State Hermitage Museum. Read more in The Moscow Times. And for a video see here: http://news.kremlin.ru/video/2776. (Link to video no longer valid). As far as I know it is not made public how the Russian State came into possession of these two Fabergé masterworks. Update December 12, 2014: In an interview with the newspaper Moskovsky Komsomolets, Alexander Ivanov, a Russian businessman who opened the Fabergé Museum in Baden-Baden, Germany, confirmed that the egg was the one he bought at Christie’s in 2007 for a record £9m. 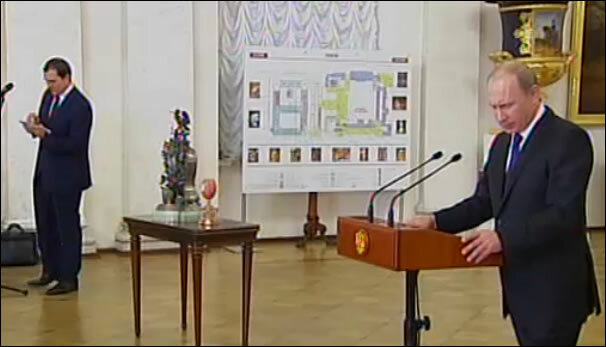 The Egg was apparently donated by Mr. Ivanov to the Russian State. Source: Moskovsky Komsomolets December 9, 2014.